Click here for the list of Veteran names submitted (as of 12/23/2011). Extra donations are being sought to maintain the wall for future generations to enjoy. One suggestion is for memorials of loved ones who have passed away to be given to this project. Several memorials have already been given to the Veteran's Memorial Wall project --- one was in memory of Wilmer Ranniger. 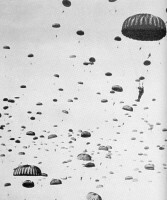 Wilmer was in the 82nd Airborne Division during WWII. The eligibility for a name to be placed on the wall is simple, the only qualifications needed are to be a veteran of any branch of service, in war-time or peace, and have been honorably discharged from their time of service. There are no geographical boundaries for persons to be placed on the commemorative landmark. "We want to open this up to everyone. It is a great way to remember friends, family and loved ones," said Gary Knueven. 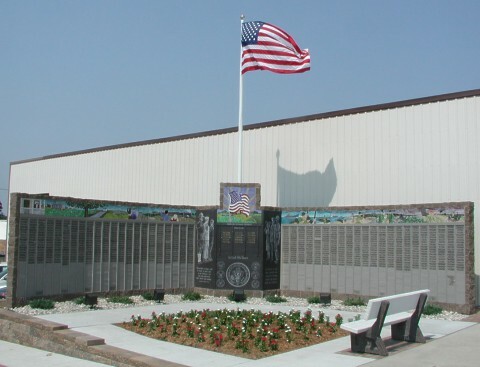 If you would like to send a donation to help defer the cost of the monument for our community, they can be sent to: Gary Knueven, 324 Main Street, Manning, Iowa or you may call him at 712-653-2121 for more information. A pictorial story on the Wall. 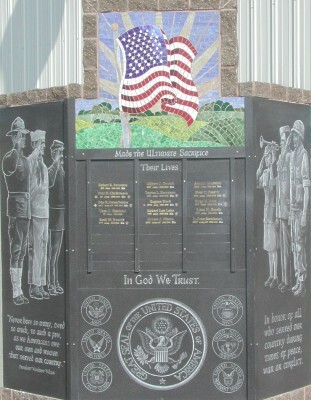 In the center of the wall you see the American Flag and the names of soldiers who lost their lives defending our country. On each side you see soldiers representing the different branches and eras of USA military history. The soldier on the left represents the Army in WWI. The soldier in the middle represents the Navy in WWII. The soldier on the right represents the Civil War veterans. The soldier on the right represents the post WWII soldier. The soldier playing taps represents the Air Force. The soldier on the left represents the women who serve in the military (specifically WAC during WWII). Notice all of the soldiers are saluting the flag and taps is being played by the soldier on the right side for those men who lost their lives defending our country. Above the names on the wall there is a pictorial history. This section shows rural scenes. On the first mosaic above you see a mother with a "Gold Star" window which meant that this home had a son or daughter killed in WWII. The next scene shows the factories that the men and women worked in to make weapons and supplies for the soldiers in WWII. This next scene shows a farm home and town in the background with a large Church steeple. The farmer and his wife who grew food to feed the military are waving to the troop trains which went through Manning during WWII. The last scene on the west wall shows a troop train coming from the rural outskirts and going through town where children would be waving flags and waving to the soldiers. During WWII the trestle in Manning was guarded by the national guard to protect it from sabotage. The image below shows the north wall. This section shows battle scenes overseas. The scene above and below shows a beach landing during WWII. This last scene shows combat during wars following WWII. The monument is covered with corian nameplates which are an artificial marble covering. This plate honors Henry Grelck grandfather of Sharon (Grimm) Williams, Jon Grimm & Susan (Grimm) Bower. Renowned local artist Clint Hansen of Audubon, designed the front of the symbolic memorial. A cold sunny December 2002 morning (5 degrees) ---- looking Northwest on Main Street. 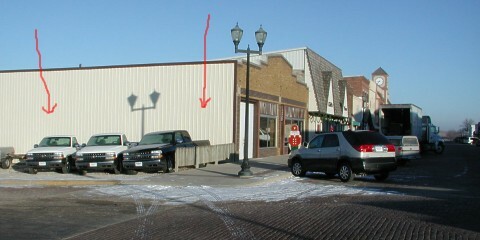 The arrows point to the location of the Memorial Wall. Many of you may remember this being the location of the Klean Klose Shop owned/operated by George & Ida Dethlefs and later by their son Kenny from the early 1920s to 1977.